Dementia is a general term for memory loss and other cognitive abilities that are required for activities of daily living . Alzheimer's Disease (AD) is the most common cause of dementia worldwide.The primary known risk factor for the disease is ageing, but AD is not a normal part of ageing. Alzheimer’s Disease is progressive so symptoms will worsen with time. There is currently no cure for the disease, but treatments are available to slow down the progression. There is a complex intertwining of mechanisms that manifest as AD. The understanding of the pathophysiology of this condition is constantly changing . Alzheimer's Disease is characterised by cortical atrophy and a loss of neurons, particularly in the parietal and temporal lobes. Also with loss of brain mass there is an enlargement of the ventricals of the brain. The changes in the brain tissue slowly cause cognitive changes in the person. Senile plaques which consist of extracellular amyloid are found in high concentrations in patients with Alzheimer's when compared with normal ageing brains . Neurofibrillary tangles in the neocortex, amygdala, hippocampus and nucleus basalis of Meynert can also occur. In a normal functioning brain, B-amyloid dissolves and the brain reabsorbs it. When it is not reabsorbed, the B-amyloid protein can fold in on itself. The proteins then connect with one another and form a plaque. These plaques cause an inflammatory response that results in the damage of more neural tissue. There may be involvement of the thalamus, dorsal tegmentum, locus ceruleus, paramedian reticular area and the lateral hypothalamic nuclei. Degenerative changes in these areas are caused by: decreased activity of choline acetyl transferase in the cerebral cortex and hippocampus and a loss of cholinergic neurons in the cholinergic projection pathway to the hippocampus. This link will guide you through a tour of the brain and explain further how Alzheimer's affects the brain. As of 2017, approximately 5.5 million people have Alzheimer's Disease in the United States and about 8 million are affected around the world. It is expected that by 2050 that number will have increased almost three fold to around 115.4 million. The known prevalence is 6% in people over the age of 65, 20% in people over the age of 80, and more than 95% in those 95 years of age.Alzheimer's disease is the sixth leading cause of death in adults. The period from onset to death is usually seven to 11 years. While death from other top 10 diseases have been observed to decline, from 2000-2014 Alzheimer’s disease as the primary cause of death has increased by 89%. Early onset AD manifests between the ages of 30 and 60 years. This occurs in 1-6%of all cases. Late onset AD manifests after the age of 60 years and accounts for around 90% of cases. Two thirds of Americans with Alzheimer’s are women. Older African Americans and Hispanics have an increased likelihood of developing Alzheimer’s or dementia than older white adults. The progression of Alzheimer's Disease is continuous and generally does not fluctuate or improve. Often times the early symptoms can be missed or overlooked because they can be misinterpreted as signs of the natural ageing process. There are some key risk factors that need to be considered with Alzheimer's Disease. There are also some factors that can help to defend a person against developing Alzheimer's disease. Adequate intake of vitamins C,E, B6, and B12, and folate. Typical forgetfulness: Sometimes forgetting names or appointments, but remembering them later. Typical troubles with planning: Making occasional errors when balancing a check book. Typical troubles: Occasionally needing help to use the settings on a microwave or to record a television show. Typical troubles: Becoming confused about the day of the week, but figuring it out later. Typical: vision changes related to cataracts What's typical? Vision changes related to cataracts. May struggle with vocabulary or have trouble finding the right word or (e.g. calling a “watch” a “hand-clock” with Alzheimer's may have trouble following or joining a conversation. They may stop in the middle of a conversation and have no idea how to continue or they may repeat themselves. They may struggle with vocabulary, have problems finding the right word or call things by the wrong name (e.g., calling a "watch" a "hand-clock"). What's typical? Sometimes having trouble finding the right word. Typical: Misplacing things from time to time like a pair of glasses or the remote. Trouble keeping up with a favourite sports team or remembering how to complete a favourite hobby. Typical: Sometimes feeling weary of work, family and social obligations. A high level of comorbidity is associated with poor self care, decreased mobility and incontinence. Increased co-morbidity is associated with lower cognitive score observed through a mini-mental status examination. Below is a list of some commonly used medications use in the treatments of the symptoms of Alzheimer's. There is also the use of other treatments such as antioxidants, anti-inflammatory agents, and estrogen replacement therapy in women to prevent or delay the onset of the disease. Donepezil - (Aricept) has only modest benefits, but it does help slow loss of function and reduce caregiver burden. It works equally in patients with and without apoipoprotein E4. It may even have some advantage for patients with moderate to severe Alzheimer's Disease. Rivastigmine - (Exelon) targets two enzymes (the major one, acetylcholinesterase, and butyrylcholinesterase). This agent may be particularly beneficial for patients with rapidly progressing disease. This drug has slowed or slightly improved disease status even in patients with advanced disease. (Rivastigmine may cause significantly more side effects than donepezil, including nausea, vomiting, and headache. Galantamine - (Reminyl) Galantamine not only protects the cholinergic system but also acts on nicotine receptors, which are also depleted in Alzheimer's Disease. It improves daily living, behavior, and mental functioning, including in patients with mild to advanced-moderate Alzheimer's Disease and those with a mix of Alzheimer's and vascular dementia. Some studies have suggested that the effects of galantamine may persist for a year or longer and even strengthen over time. Tacrine - (Cognex) has only modest benefits and has no benefits for patients who carry the apolipoprotein E4 gene. In high dosages, it can also injure the liver. In general, newer cholinergic-protective drugs that do not pose as great a risk for the liver are now used for Alzheimer's. Memantine - (Namenda) targeted at the N-methyl-dasparate receptor, is used for moderate to severe Alzheimer's. Selegiline - (Eldepryl) is used for treatment of Parkinson's disease, and it appears to increase the time before advancement to the next stage of disability. Currently, diagnosis of Alzheimer’s relies primarily on signs and symptoms of mental decline. Primary care physicians and physical therapists can screen for dementia presentations, the next section describes tools for recognising dementia or alzheimer’s presentations in patients. Below are current research developments utilised to exclude other possible diagnosis, while confirming the progression of Alzheimer’s disease. Onset of the disease occurs between 40 and 90 years old and most often after 65 years old. Experts are in the process of developing “biomarkers” (biological markers) in order to recognise a presence of the disease. Examples of biomarkers being researched for disease confirmation are beta-amyloid and tau levels in cerebrospinal fluid with changes in brain injuries. These biomarkers have been suggested to change throughout the course of the disease process. Biomarkers have yet to be validated. Standard imaging used to detect brain changes in patients includes magnetic resonance imaging (MRI) and computed tomography (CT). Imaging is primarily used to rule out other conditions which although similar to Alzheimer’s would require different treatment such as tumours, small or large strokes and trauma or fluid in the brain. Cerebrospinal Fluid (CSF) Proteins CSF can be observed through a lumbar puncture or spinal tap. Research suggests that throughout early stages of Alzheimer’s disease changes in CSF involving two proteins (beta-amyloid and tau) promote abnormal brain deposits linked to the disease. A challenge faced by researchers is the variance among protein levels observed between institutions. Research is currently being performed to set standards for CSF proteins in relation to Alzheimer’s disease. Three genes rare genes have been linked to causing Alzheimer’s Disease such as Amyloid Precursor Protein (APP), Presenilin-1 (PS-1), Presenilin-2 (PS-2). Another gene associated with a high risk of developing Alzheimer’s disease is Apolipoprotein 4 (APOE-4). Genetic testing is not currently recommended outside of research because there are no current treatments that can alter the course of Alzheimer’s. Pittsburgh Compound B (PIB), Amyvid, Vizamyl or Neuraceq Since 2012 have been developed to recognise amyloid plaque.While amyloid plaque can be recognized under positron emission tomography (PET) this cannot be used as a diagnostic criteria as not all individuals with amyloid plaque have symptoms. Therefore, tracers are currently not recommended in diagnosing individuals with Alzheimer’s Disease. Objective tools have been validated in the practice of physical therapy in order to screen for AD such as the Mini-Cog, Mini-Mental State Exam (MMSE), Clock-Drawing, & Neurobehavioral Cognitive Status Exam. Screening tools can be chosen based upon sensitivity, specificity and time to administer the screen. Mini-Mental State Exam was validated for detecting possible dementia, however time to administer the exam keeps physicians from using it. The MMSE takes 5-12 minutes to administer and is composed of 20 questions in 5 categories to observe orientation, memory, attention-concentration, language and constructing. Below are current findings for ruling the differential diagnosis of AD in or out, due to how the tests perform in terms of sensitivity, it would be best to cluster these tests in order to rule in the possibility of dementia or AD. There is currently no cure for Alzheimer's Disease, so medical management is focused on maintaining quality of life, maximizing function, enhancing cognition, fostering a safe environment and promoting self engagement. Maximizing dementia functioning involves monitoring the patient's health and cognition, patient and family education, initiation of pharmacological and non pharmacological treatments. ○ Although the disease progression cannot be altered, it may be slowed by the pharmacological medication listed above. ○ Agitation, aggression, depression and psychosis are the primary cause of assisted living or nursing home placement. ○ Assessment of behaviors occurring suddenly is important to increase patient comfort, security and ease of mind. ○ Patients should return on a regular basis in order for the physician to monitor the course of Alzheimer’s disease (behavioral and cognitive changes). ○ Regular follow-up appointments allow for adaptation of treatment styles to fit the needs of the patient. ○ There are concerns regarding alternative treatments in addition to physician-prescribed medicine. If any concerns are questions brought to attention, the physician should be notified. ○ Many caregivers seek to meet the needs of the physician and the patient which increases rates of stress and depression. Physicians should continue to monitor the status of the caregivers watching out for burnout and providing them with resources as well. It is important to modify risk factors that can be changed through lifestyle activities. Hypertension has been shown to interact with a particular genotype that is at risk for developing Alzheimer’s disease. This interaction increases amyloid deposition in cognitively healthy middle aged and older adults. Thus, when at risk it is important to manage blood pressure, which can be done through exercise. A community based exercise program has been shown improve multiple domains of life for individuals with Alzheimer's. In a study by Vreugdenhil et al., community dwelling individuals with Alzheimer's added a daily home exercise program and walking under supervision to a usual treatment plan. Those participating in the additional exercise improved in cognition, mobility, and instrumental activities of daily living. It has been suggested that aerobic exercise in the form of walking and upper limb cycle ergometer in particular helps to improve exercise tolerance as well as quality of life in individuals with Alzheimer's. Strength training in addition to aerobic training has been supported in the research. The combination of both activities have shown greater improvements in cognition than aerobic training alone. Individuals with dementia are at an increased risk for falling compared to the average population of community dwelling older adults. Preliminary research has been conducted looking at falls prevention training for individuals with intellectual disorders such as Alzheimer’s disease. A study found that using a modified Otago Exercise program was effective at decreasing falls risk for some adults with intellectual disabilities. A pilot study found that the Berg Balance Scale had relative reliability values that support its use in clinical settings. However, MDC values are not established for this population. More research is needed in this area to best assess falls risk in this population. Frequently,when a physical therapist works with a patient who has been diagnosed with an Alzheimer's, the patient may be in a structured living environment because they have progressed to a stage in the disease where their caregivers can not give the patient the proper attention that they need. Physical therapy can provide the patient with an activity that the patient can perform successfully at and it also can help to improve their breathing, mobility, and endurance. Restlessness and wandering can be typical of the patients with Alzheimer's patient and may be managed with physical therapy (by releasing some of the energy through exercises). These exercises can help to reduce the night time wanderings called sundowning. Group therapy is also successful with patients with Alzheimer's disease, but the session must not provide more stimulation than the patient is able to tolerate. Repetition and encouragement are also very important to help keep the patient's confidence high and to help with remembering the exercises. Knowing the patient is important to the therapist because it can allow for better communication, by using words and terms that the specific patient may be more familiar with. The Preferred Practice Pattern is 5E: Impaired Motor Function and Sensory Integrity Associated with Progressive Disorders of the Central Nervous System. The physical therapist can use the Global Deterioration Scale to assess the level of dementia. When a patient with Alzheimer's is placed in a comprehensive cognitive stimulation program it enhances the neuroplasticity of the patient. The exercise can also help to improve mobility, balance, and ROM for the patient as well as improve the mood. Staying physically and socially active can possibly help to decrease the risk for dementia along with staying mentally active. It has been found that maintaining a healthy diet may help to prevent or slow the progression of Alzheimer's. It is suggested that the diet be low in fat, high in omega-3 oils, and high in dark vegetables and fruits, also adding vitamin C to the diet along with coenzyme Q10, and folate may work to lower the risk of Alzheimer's. There does not seem to be one single aspect of diet that provides neuroprotection, rather that the items work together to decrease risk of AD.There is also some interest in the use of antioxidants such as vitamin E and ginkgo, along with anti-inflammatory agents, and estrogen replacement therapy for women. ↑ Goodman CC, Fuller KS. Pathology: implications for the physical therapist. St. Louis, MO: Elsevier Saunders; 2015. ↑ Porth C. Pathopysiology Concepts of Altered Health States. Philadelphia PA: Lippincott and Wilkins; 2005. ↑ Reitz C, Mayeux R. Alzheimer disease: Epidemiology, diagnostic criteria, risk factors and biomarkers. Biochem Pharmacol. 2014, 88; 4: 640-651. Accessed 21 November 2018. ↑ Borson S, Scanlan JM, Chen P, Ganguli M. The Mini-Cog as a Screen for Dementia: Validation in a Population-Based Sample. Journal of the American Geriatrics Society. 2003;51(10):1451–4. ↑ Phillips, C. et al. 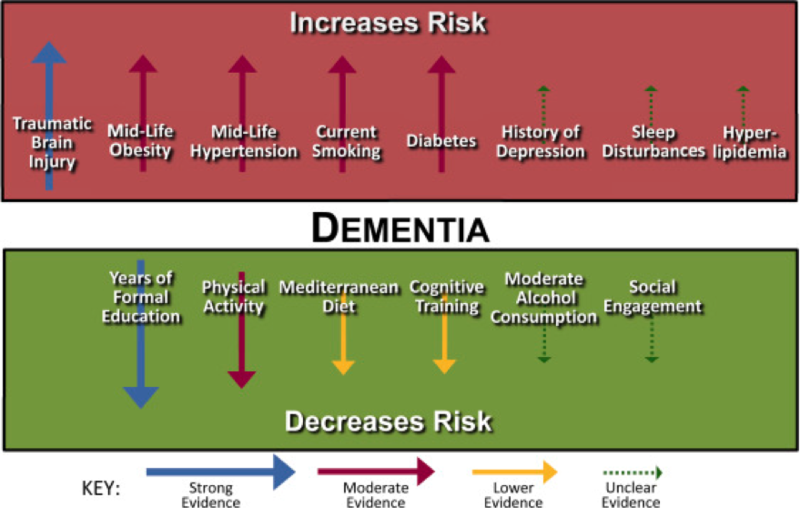 "The Link Between Physical Activity And Cognitive Dysfunction In Alzheimer Disease". Physical Therapy 95.7 (2015): 1046-1060. Web. 1 Apr. 2017. ↑ Vreugdenhil, Anthea et al. "A Community-Based Exercise Programme To Improve Functional Ability In People With Alzheimer’S Disease: A Randomized Controlled Trial". Scandinavian Journal of Caring Sciences 26.1 (2011): 12-19. Web. 1 Apr. 2017. ↑ Mahmoud S. “Role of aerobic exercise training in changing exercise tolerance and quality of life in Alzheimer's disease”. European journal of general medicine. 2011;8(1):1-6. Web. 1 Apr. 2017. ↑ Manckoundia, Patrick et al. "Impact Of Ambulatory Physiotherapy On Motor Abilities Of Elderly Subjects With Alzheimer's Disease". Geriatrics;; Gerontology International 14.1 (2013): 167-175. Web. 1 Apr. 2017. ↑ Renfro M, Bainbridge D, Smith M. Validation of Evidence-Based Fall Prevention Programs for Adults with Intellectual and/or Developmental Disorders: A Modified Otago Exercise Program. Frontiers in Public Health. 2016;4. Web. 1 Apr. 2017. ↑ Muir-Hunter S, Graham L, Montero Odasso M. Reliability of the Berg Balance Scale as a Clinical Measure of Balance in Community-Dwelling Older Adults with Mild to Moderate Alzheimer Disease: A Pilot Study. Physiotherapy Canada. 2015;67(3):255-262. Web. 1 Apr. 2017.